The wedding of Tatyana and Aleksandr it was one of the simpliest wedding that will leave the emotions of the place where is did: Praiano, in the Amalfi coast! They arrived from Moscow just after their real wedding ceremony in the district hall and they needed to search a romantic place where they could spend their honeymoon and celebrate a romantic symbolic wedding with parents. The wedding planner engaged had found for them a gorgeous place in Praiano and I was honered to be their photographer. The couple story was started in Moscow on 2009, she was working in her society in Novosibirsk when was called in Moscow for a work upgrade with some other colleagues. It was here that she met him, senior manager of the project. Aleksandr had given a lot of attentions to all the group not only in working time, but also outside in the life in Moscow, so the interest in Tatyana to Aleksandr beginning daily more and more until on Christmas holiday when they went in vacation to Austria, their love started. When they came back to Moscow to the ended of the project, Tatyana must come back to Novosibirsk, he can’t life without her so he wrote her a letter with his declaration of love for her asking to come to live in Moscow together and build their life like a family. I was honoured to be a part of their love in one of the best moment of their life, the wedding day, where I was there like photographer with another excellent photographer, Aleksandra. 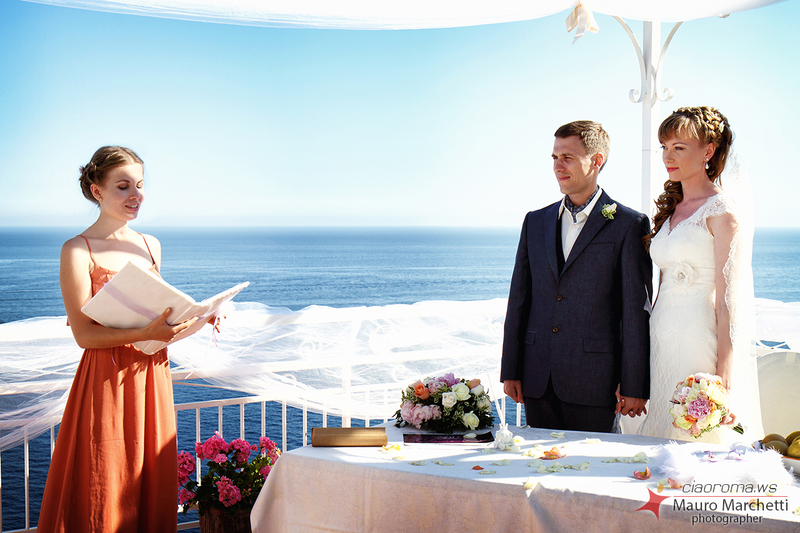 The ceremony was celebrated on the terrace of the Hotel Torre Saracena in Praiano, a delicious place builded on the cliff in the Amalfitan coast, with a enormous view of the blue sea. When I was arrived in the location there was the florist that was setting up the roof for the symbolic ceremony with flowers, tulle and ribbons, on the table there was a basket with the biggest lemons growing on the zone. There was also the wedding planner that was talking with the sax player, with waiters, with the makeup artist and with the driver of newlyweds car. Everything was ready for the beginning of the ceremony, the groom was coming on the terrace with his mother in a side and one minute late was coming the bride with his father. The sax gave to the ceremony a wonderful romantic atmosphere, everybody had good emotions of happiness, the sea perfume was in the air with a fresh wind that give to the wedding a magic wonder, maybe was also the words said from the celebrant that gave a touch to the heart of the bride when she was beginning to cry. At the end of the ceremony everybody start to dance and enjoy this best moment in the life. On the main door of the Hotel there was the throwing of the roses petals and the car that drive them for a touristic tour in the Amalfitan coast. It was a very closest wedding with a lot of emotions and relaxing atmosphere!